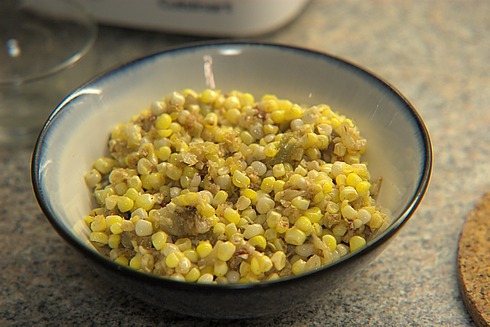 This recipe was inspired by one from Gourmet magazine (sigh, I miss Gourmet) that I came across when searching for something new to do with corn. I had a purple bell pepper (I am a total sucker for unusual colors in vegetables) and a banana pepper waiting in the fridge, and thought they would pair nicely with the corn. You could use any peppers for this, although red bell peppers would probably be the prettiest. I kept the dressing just about the same as it was in the original recipe, but changed around the actual salad quite a bit. The original recipe included grilled avocados, which sound amazing - although sadly not local to MA - and would probably be a nice addition to my version of the salad. To roast peppers: Heat oven (I did this in a toaster oven to avoid heating the whole kitchen) to 450-500 deg F*. Halve peppers and clean out seeds and membranes. Line a baking sheet with aluminum foil, and lay peppers on sheet, skin side up. Roast until skins are dark brown or blackened and blistering. Remove peppers and place in a ziploc bag, brown paper bag, or tupperware container. Close container and let peppers cool and steam for about 20 minutes. When cooled, remove skins (they should come off easily) and chop pepper flesh. Meanwhile, melt bacon fat in a heavy skillet over medium-high heat. 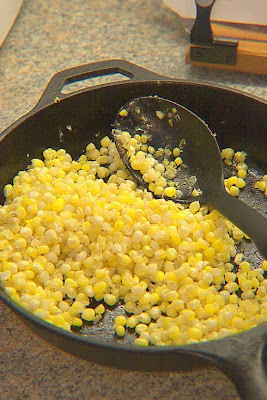 Add corn kernels and cook until tender, about 3-4 minutes. 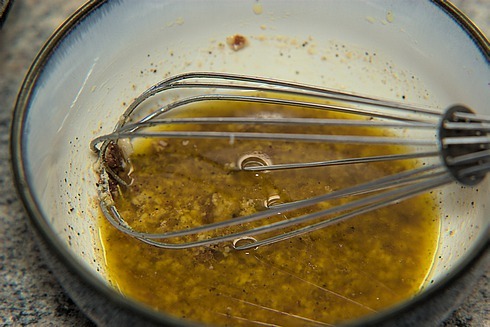 To make dressing: Put parmesan in a small bowl and add olive oil in a slow stream, whisking. Whisk in lime juice, garlic, chipotles, and 1/8 tsp each of salt and pepper. Toss corn and peppers with dressing and serve. * You could do this on a grill if you have one. In this case, leave the peppers whole while you grill.